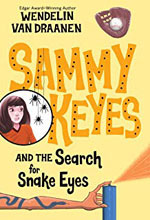 "The Sammy Keyes series keeps getting better and better. In the seventh title in the series, a frightened teen at a video arcade asks Samantha to hold a package for her. When the girl disappears, Sammy finds that she’s now responsible for what’s in the package--a baby! Tara Sands captures the youthful energy of the young sleuth and her best friend, Marissa, as they try to find the boy’s mother while avoiding “Snake Eyes,” the sociopathic gang member who is after the mom. Despite the light tone of Van Draanen’s writing and Tara Sands’s cheerfully cherubic performance, the book deals with hard issues--gangs, teen pregnancy, domestic abuse--and handles them with honesty. Sands maintains momentum as she shifts from Sammy and her classmates to Hispanic gang members, from the ill-tempered Officer Borsch to prying Mrs. Wedgwood. Sammy Keyes is a keeper--that is, if she survives junior high."